After receiving the Pandemrix vaccine to prevent swine flu, nearly 1,700 people developed narcolepsy. Almost 1,700 Europeans who have a rare sleep disorder linked to being vaccinated against swine flu looked to the European Commission on Monday for recognition of their struggle. The representatives of those affected by a neurological disorder as a consequence of being vaccinated with Pandemrix during the 2009-10 swine flu outbreak in Europe want the European Commission to give them official recognition in the near future. They hope a public statement by the Commission acknowledging the scientific evidence that shows Pandemrix is likely to have been responsible for causing narcolepsy would unlock claims for compensation and fuel research. They also want society’s recognition of their struggle with a rare disease they got as a side effect of vaccination. “Everyone in Europe should understand and know this,” said Peter Todd, a lawyer at the London-based Hodge Jones & Allen firm, which represents 88 people who have narcolepsy as a result ofthe Pandemrix vaccination in the U.K. He spoke shortly after meeting the EU Commissioner for Health and Food Safety Vytenis Andriukaitis in Brussels. Todd said the commissioner lent a sympathetic ear to the Pandemrix victims’ representatives and promised to take action. Hundreds of people given Pandemrix, most of them children at the time, developed the rare and long-term sleep disorder that affects the brain’s ability to regulate the normal sleep-wake cycle, Todd and other representatives of victims from Ireland, Sweden, Finland and Denmark say. 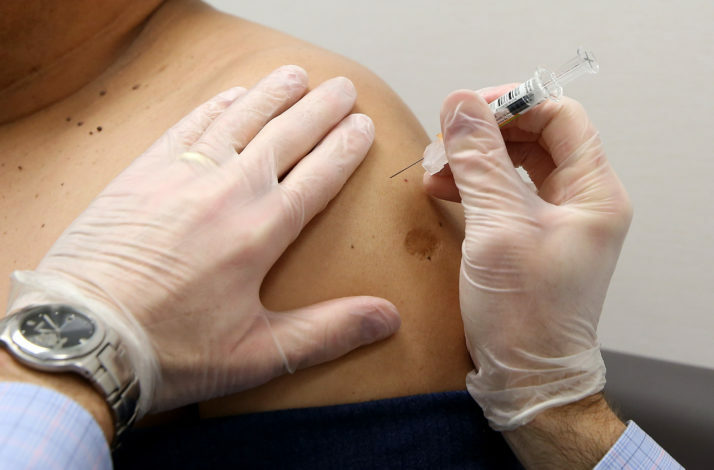 The European Medicines Agency said in 2011 that the vaccine should not be given to people under 20, unless seasonal trivalent influenza vaccine was not available and if immunization against swine flu was still needed. “We want the same thing for those with narcolepsy in our countries as for thalidomide,” Todd said, referring to the well-known drug used by pregnant women in the 1950s and 60s to alleviate morning sickness that ended up causing birth defects such as short limbs in newborns. The thalidomide case sparked the introduction of the first European law regulating pharmaceuticals in 1965. While some victims in the Scandinavian countries have been compensated through an existing insurance fund, most of those in Ireland and the U.K. have not been compensated, according to the representatives. A lawsuit is still making its way through the courts in the U.K., Todd said. The British government has acknowledged the link between a surge in narcolepsy cases and the Pandemrix swine flu vaccine. That opened the door to claims for compensation under the country’s Vaccine Damage Payments Scheme, according to Narcolepsy U.K. It entitles anyone found to have suffered a severe disability as a result of certain vaccines to £120,000 under the scheme. In Ireland, “the state is not dealing with this with the urgency is deserves,” said Tom Matthews, the Irish representative of narcolepsy patients, whose 19-year-old daughter has the condition after getting the vaccine. The plan would be for the Commission to release a statement to the European Parliament officially recognizing the Pandemrix vaccine as the cause of narcolepsy in the 1,700 people, Todd said. Irish EPP Vice President of the European Parliament Mairead McGuinness and Danish ECR member of the European Parliament Jørn Dohrmann participated in the meeting with Andriukaitis in support of the narcolepsy patients’ plea.“Good meeting with @V_Andriukaitis and support groups, #narcolepsy action must follow. #publichealth #Pandemrix,” McGuinness tweeted. The group also asked the Commission for narcolepsy research funding and to learn a lesson from the experience, Todd and Matthews said. “None of us are anti-vaccine,” Matthews said. There are limited treatment options for narcolepsy, the patient representatives said, and in many cases, they are expensive and come with serious side effects. In March, the European Commission approved Wakix, produced by French company Bioprojet Pharma, as an orphan drug for the treatment of the ailment. The French health technology assessment body HAS said in June that the drug had minor added value in the treatment of narcolepsy patients.